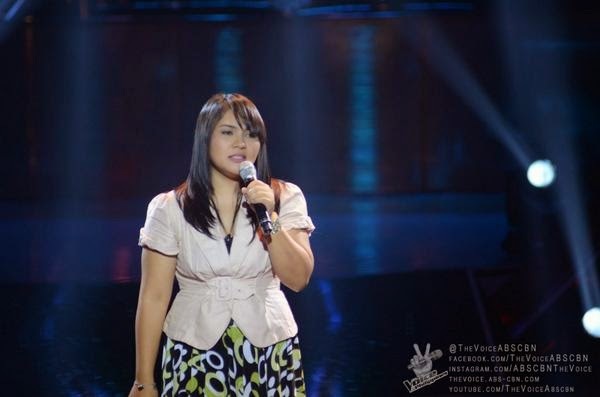 Manila, Philippines - Dang del Rosario of Bulacan performed Regine Velasquez song "Araw Gabi" during the Blind Auditions of ABS-CBN's trending vocal competition 'The Voice of the Philippines Season 2 aired on Sunday, November 9, 2014. The 30-year old singer wowed Coach Lea Salonga and Bamboo Manalac. Dang chose Team Bamboo. As of the November 9 episode, 17 artists have already convinced with at least one coach to turn around. At the end of the Blind auditions, each team will have 14 artists. The Top 56 artists will be named which include stolen artists for each team. The Sunday's episode of 'The Voice of the Philippines' Season 2 dominates online conversations with '#VoiceWeekend', 'Miro' and 'AKA JAM' among the trending topics.